I think they offset the pallet of black and gray (my fav) very well. Other than the Womb chair, which I found to be one of the most uncomfortable ever, I could live here. Wrote it once and now again – your yellow/orange stained floors are NOT UGLYl! 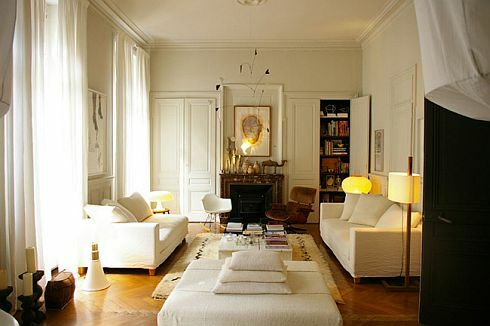 These kind of colour you can find in many old apartments here in europe and it gives a room a warm welcome glow. I think, it is more the combination with the other woodwork in your home that is not really good working. The floors are not stained. They are oak. That is generally what urethane/varathane coated oak looks as it ages. I have these throughout my house, too–with fir (oh joy, red, in the bedrooms). Don't love them, and would prefer a more med brown colour. Someday maybe I'll refinish and stain, but for now I have two young kids and a dog – so I let them be. I have the exact floors. not in as nice condition and like kim, I've rued their orangey hue and regretted not bleaching or staining them ashier/darker ever since i moved in seven years ago. that said, the pics in this post are stunning, floors and all, and like another poster commented, they are the classic original to this look. my house is a sears kit from 1926. i suppose if i contextualize it differently, i can like them a little more. beautiful house and kids in that post.